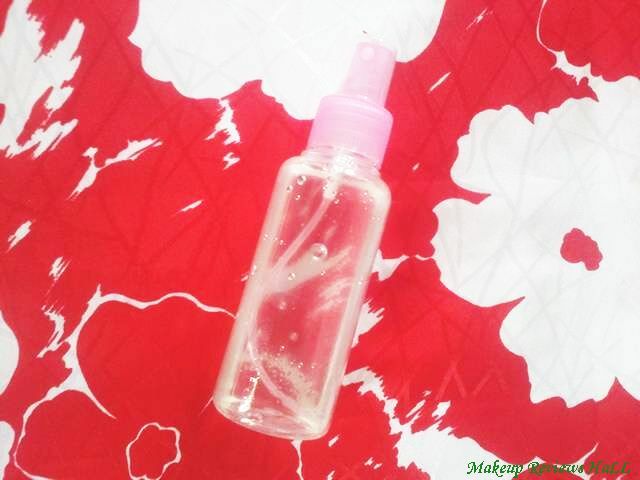 You call it homemade makeup fixing spray, finishing spray or your own setting spray to make your base stay fresh for longer and remain intact like before. I wasn't too much aware of the importance of primer and makeup fixers initially since I had no idea how much difference these products can to do your entire makeup. But after realizing their use, effect and using few from different brands like Oriflame etc, I simply cannot afford to skip these from my entire makeup regimen. I always keep a makeup fixing spray even when I'm outstation but the only concern with the spray is that these are little expensive but the bigger issue being that the are very few variants of these finishing spray from different brands is available in India. In fact most of them are very difficult to see in the local cosmetic shops specially if you live in a small city, big regard to the amazing online shopping sites in India that come as a great relief and as a most convenient way of shopping. So to overcome all such issues I decided to make my own finishing spray with just few ingredients easily available with most of us which makes this super cheap and super easy to make. So without wasting any time let's start with the method of making our own quick and easy Makeup Setting Spray. 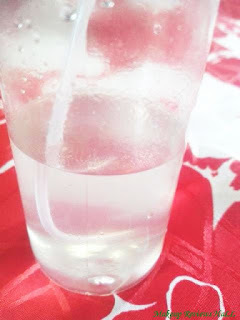 Distilled water - Half cup around 100 ml. 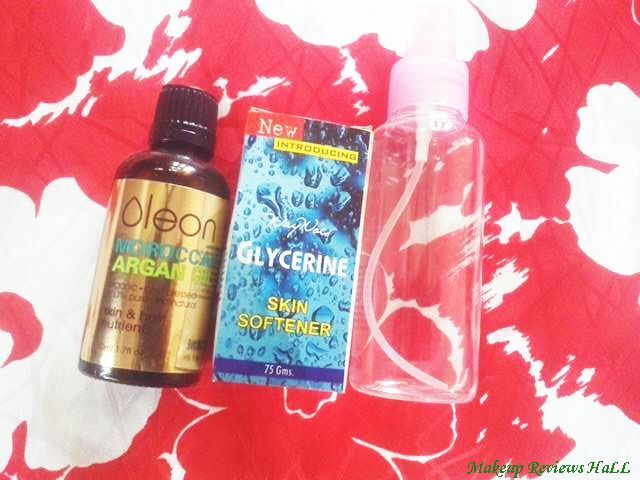 Vegetable Glycerine - 2 tbsp around 10 ml. Essential Oil - Tea Tree / lavender/ Rosehip/Moroccan Argan Oil - 2 drops. This step is totally optional if you want to add the goodness of these special oils according to your skin type. People with acne prone skin can add tea tree oil, lavender is common for all. Rosehip oil is great for both acne and dry skin and lastly pure argan oil to add the goodness of vitamin E. Avoid using oils like tea tree if you need to use it on your eyes as well. Add all the ingredients water, glycerine, oil into the spray bottle one by one and mix thoroughly to get a uniform consistency. I even added vitamin E capsule so that it remains fresh for long but its totally up to you, this step again is optional specially if you are adding any other oil like argan oil contains vitamin E. Keep mixing nicely and once you see even liquid without separated layers of oil and water, then you are all done. 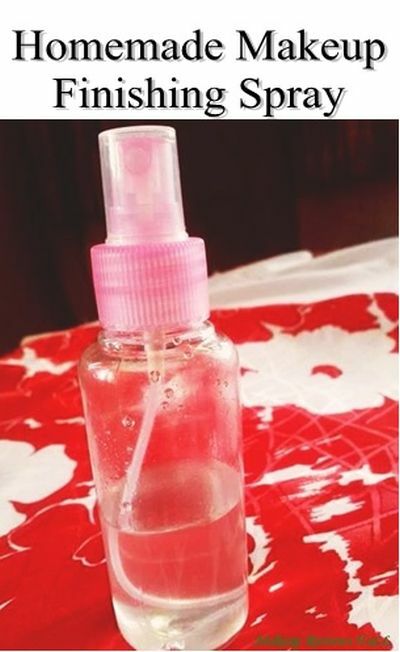 You are all ready with the own homemade DIY super affordable makeup fixing spray. The application of this setting spray is super easy. Once you are all set with your makeup, just hold this spray bottle in your hand at some distance around 10cm and then gently spray twice or thrice covering your entire cheek area on both sides. Sometimes I even spray it over my eyes with closed eyelids to make eye base last longer but I normally avoid using the water based spray on eyes specially when I'm not wearing waterproof makeup on eyes which is quite normal in daily makeup with light to medium coverage. Now this Homemade Setting Spray is a complete in itself. It not only makes your makeup last longer if used properly but also helps on adding shine to your face giving you a perfect dewy look. I normally don't like complete matte look unless it's really hot and sweaty and love the glow the dewy look adds to my face. So I just love using this finishing spray above powder foundations, dry foundations and even above mousse like Maybelline Dream Matte Mousse Foundation which gives a very dry finish. This is one of the reasons I like spray more then setting powders because these are so versatile along with giving a smooth glowing finish to skin. I am using this spray very frequently these days specially when I go for parties and have wonderful results with this setting spray. I had little problem when I initially made this spray. The spray turned out to be little thick which started making skin sticky after some while and this happened because I used more amount of glycerine than required. Then I reduced the glycerine quantity next time which gave me perfect results. 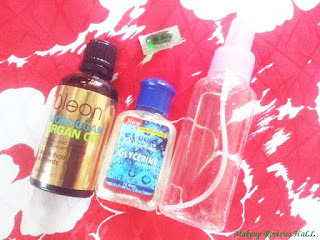 So initially try this homemade fixing spray with just minimum amount of glycerine and you can always add more if required. So this was all about this Homemade DIY Makeup Finishing Spray. I hope you like this diy recipe and this is super simple to make. Do try and let us know how this turned out to be and leave your comments if you have any query. Labels: DIY Makeup Fixer, Finishing & Setting Spray, HOME MADE, Homemade Fixing, Makeup. I use Lotus herbals makeup toner and it acts as a primer for me :) I am addicted to setting sprays and I agree Maybelline dream matte foundation does need a lot of spraying to hide the high matte effect!